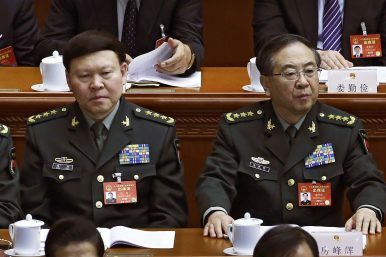 In this March 8, 2017, photo, Zhang Yang, left, the then-head of China's People's Liberation Army (PLA) political affairs department, and Fang Fenghui, right, the then-chief of the general staff of the Chinese People's Liberation Army, attend the China's National People's Congress (NPC) at the Great Hall of the People in Beijing. On October 16, China’s state news agency Xinhua announced that Fang Fenghui and Zhang Yang, two former top general in the Chinese People’s Liberation Army, were officially expelled from the Chinese Communist Party (CCP). Both fallen generals had been stripped of their ranks earlier by the Central Military Commission (CMC), the highest body that controls the Chinese military. As The Diplomat has been closely following, the fall of both senior generals was verified several months ago. As The Diplomat reported previously, Fang and Zhang had worked closely as colleagues for decades in the military. Both also had close links to Guo Boxiong and Xu Caihou, the two highest ranking military officers to have been brought down under the anti-corruption campaign launched by Xi Jinping. Xu died of cancer in 2015 before he could face trial; Guo was sentenced to life imprisonment for bribery in 2016. Fang, the former chief of joint staff, has close ties to disgraced top generals who are accused of attempting a coup.